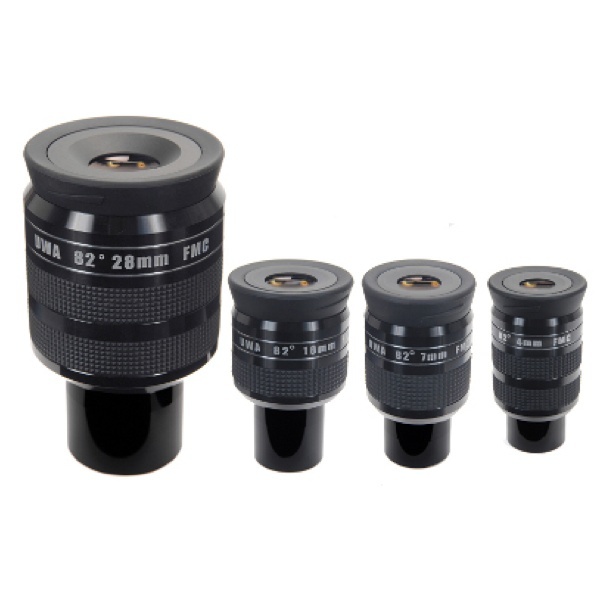 These top quality ultra wide angle 1.25” eyepieces offer an incredible jaw-dropping viewing experience to rival some of the leading premium eyepieces on the market, but at an extremely competitive price. The huge 82 degree apparent field of view, superb field-edge correction and excellent contrast combine to provide a wonderfully immersive and memorable observational adventure. Work superbly in telescopes of all focal lengths. All models are constructed with 7 lens elements in 4 separate groups. These exotic eyepiece models feature large eye-lens elements and soft twist-up rubber eyecups for comfortable viewing. All models are fully broadband multi-coated, feature blackened lens edges, internal baffling and are parfocal. 12mm eye relief on all models. Beautifully finished in high-gloss anodized aluminium with knurled rubber grips. Threaded to accept standard 1.25” filters. Weight approx 200g.